First of all, thank you from the bottom of my heart to anyone who nominated me for a Company Magazine Style Blogger Award this year. Your support means the world to me and I literally wouldn’t write my blog if it wasn’t for the incredible support I have gained over the last 18 months. I am so unbelievably grateful to say I have been shortlisted, because of you guys, and I am now in the running for Best Personal Style Blog!! Overwhelmed is not the word. I am up against incredible competition this year and I would love to win such a prestigious category. If you could spare 30 seconds, literally 30 seconds, I would be so so thrilled if you could please now vote for me to win. 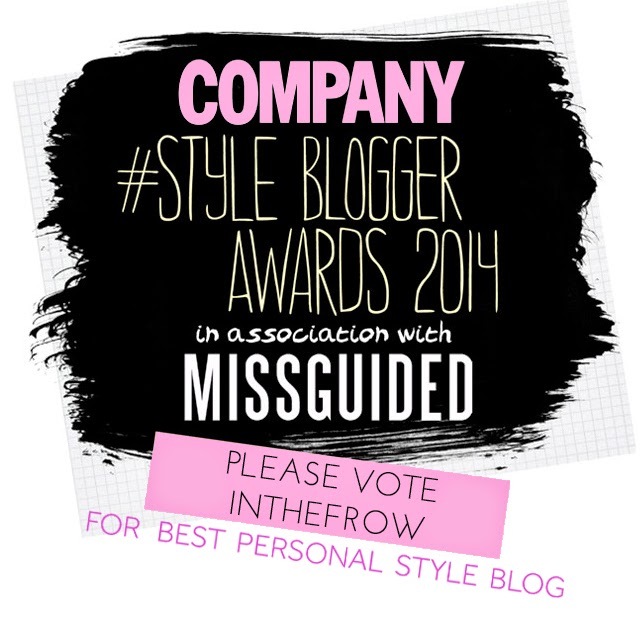 Just click here, select Inthefrow on that page, in the Personal Style Blog category, then hit next. You can then choose to select other bloggers to win the other 9 categories, or you can keep hitting ‘Next’ 9 times until you get to the final page. You just need to enter your name and email and then ‘Submit’ and your vote is cast. Truly thank you so so much to anyone who takes the time to vote for me. Winning this award would be the most incredible achievement and will truly push me to continue on with the hard work I put in every single day. I love my blog and I truly hope you guys love it too. So a vote for that appreciation would mean everything and more. Thankyou so much for your continued support. Seriously love you all. The Ray Ban Classics – Giveaway!